President Trump on Thursday renewed calls for Congress to increase funding for his proposed wall along the U.S.-Mexico border, vaguely casting doubt on whether he will sign two spending bills to keep the government open past September. 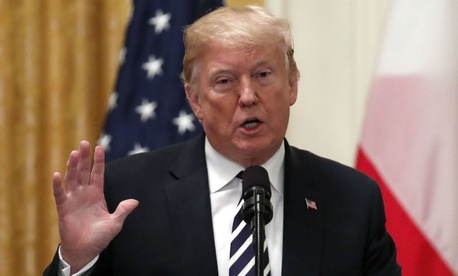 Although he did not reiterate his threat to trigger a shutdown of federal agencies, Trump called into question an agreement struck by Democratic and Republican lawmakers last week to maintain spending governmentwide after appropriations expire on September 30. As part of that deal, congressional leaders agreed to advance a short-term continuing resolution to fund agencies not covered under already passed minibus appropriations bills until Dec. 9. Included in the continuing resolution are the Interior Department, the Environmental Protection Agency, financial services and general government agencies, the Agriculture, Transportation and Housing and Urban Development departments, and the Homeland Security Department. In March, Trump signed a $1.3 trillion omnibus spending package, but warned he would “never sign a bill like this again.” Congressional appropriators worked around this stipulation by developing a series of minibus packages, each containing several traditional appropriations bills, in the hopes of avoiding a shutdown weeks before midterm elections. The first minibus (H.R. 5895), which includes appropriations for Energy and Water, the legislative branch, military construction and the Veterans Affairs Department, was approved by the House and Senate last week, and formally presented to the president Tuesday. But as of Thursday afternoon, Trump had not signed the measure into law, despite a supportive statement from the White House issued last week. “President Trump looks forward to signing this legislation and continuing to work with Congress to enact fiscal year 2019 funding for the Department of Defense, Department of Homeland Security, and other agencies, while continuing to show fiscal restraint,” said White House Press Secretary Sarah Huckabee Sanders. House and Senate appropriators came to an agreement on the second minibus (H.R. 6157) last week. Although the House is in recess until Monday, the Senate voted Tuesday to approve the bill, which includes funding for the departments of Defense, Labor, Health and Human Services, and Education, as well as the continuing resolution that funds all agencies for which lawmakers have not come to an agreement. When the House returns to Washington, D.C., on Tuesday, lawmakers will have four scheduled legislative days to approve the second minibus. Then it will be up to Trump to sign both measures to keep the government open.